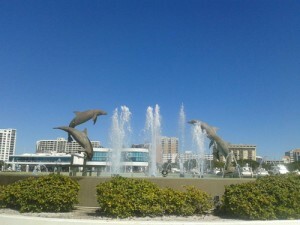 A view of the dolphin fountain at the beautiful Bayfront Park near Marina Jack in Downtown Sarasota. Sarasota is a beautiful city on Florida’s Gulf Coast. From the downtown section that is full of waterfront restaurants and a great nightlife to St. Armand’s Circle that features many great shops and a diverse selection of local eateries, to the world renowned Siesta Key Beach, Sarasota is one of the most culturally rich and vibrant cities in all of Florida. Sarasota is protected from the Gulf of Mexico by the exclusive barrier islands of Siesta Key and Long Boat Key, that are known for their spectacular white sand beaches and luxurious homes. Sarasota, Florida has something for everyone and is the perfect place to call home, vacation, or make an investment. Browse Sarasota homes for sale, or click the “Use Map Search” button below to enter your own criteria to find properties. You can narrow your choices to waterfront homes, pool homes, number of bedrooms and baths and more. Enter your price range for homes or condos for sale in Southwest, Florida and find just what you are looking for. Ideal Sarasota Downtown location. Walking distance to restaurants, theaters, farmer's market and festivals making this house perfect place to call home. This gorgeous Contemporary/Modern home features 3 bedrooms, 3 baths. Enjoy a spacious kitchen and open dining - living room area that makes entertaining guests a breeze! There is both a front porch and a back lanai where you can relax and enjoy the warm weather. This wonderful home is close to Gillespie Park, just a few minutes to St Armand’s Circle & the beach! Welcome to Soleil! This like-new first-floor unit offers peace and tranquility, unlike any other currently available in the community. If you know Soleil, you know the preferred location is on the east side of Enclave Way, past the amenities. This is it! Plenty of privacy, and a short walk to the amenities. The last first-floor unit on the preserve-side of Enclave Way sold before it ever made it on the market. Priced to sell fast. Don't miss out! Nice starter home, second home or investment property in great location on cul-de-sac with pool, large fenced yard and fireplace! Near beaches, shopping, hospitals, I-75. A diamond in the rough, just needs a little updating. Bright, furnished 2/2 unit - glass enclosed lanai overlooking golf & water - Great investment! Close to UTC Mall, I-75, Restaurants, etc. Unique West of the Trail property consisting of 1 home and a separate efficiency apartment. The main home has 2 bedrooms and 1 bath. The efficiency consists of an 18x10 living area, 1 bath, and a kitchen. Both are in need of major renovation throughout. Property also has a fenced back yard. Property is bank owned and is being sold AS IS with no repairs. Cash Offers Only. Conveniently located just a short drive or bike to downtown Sarasota, Ringling Museum, New College and Ringling College of Art and Design and the Sarasota bayfront. Investors Gold Mine! Pre-Construction. To be built. Pre-Construction-TO BE BUILT. This beautiful custom home will feature all of the details and finishes found in a John Cannon Home. The floor plan features a great room that is open to both the kitchen and dining room and overlooks the pool and outdoor living area.2 separate en-suite guest bedrooms flank the oversized kitchen that offers plenty of seating around the kitchen island. PRICED AT DIRT VALUE! Come build the home of your dreams or bring your imagination and update the 1965 built, 2,952 sq/ft home on an extremely rare ½ acre lot on Siesta Key with water on 2 sides! A boaters dream come true! With no bridges to bay, this location is one of the prime spots on Sarasota’s waterfront. With over 300 feet of canal frontage, this lot affords plenty of opportunity to create your own tranquil utopia. Current owner has preliminary architectural and dock layout drawings. Don’t miss out. This opportunity won’t last long!